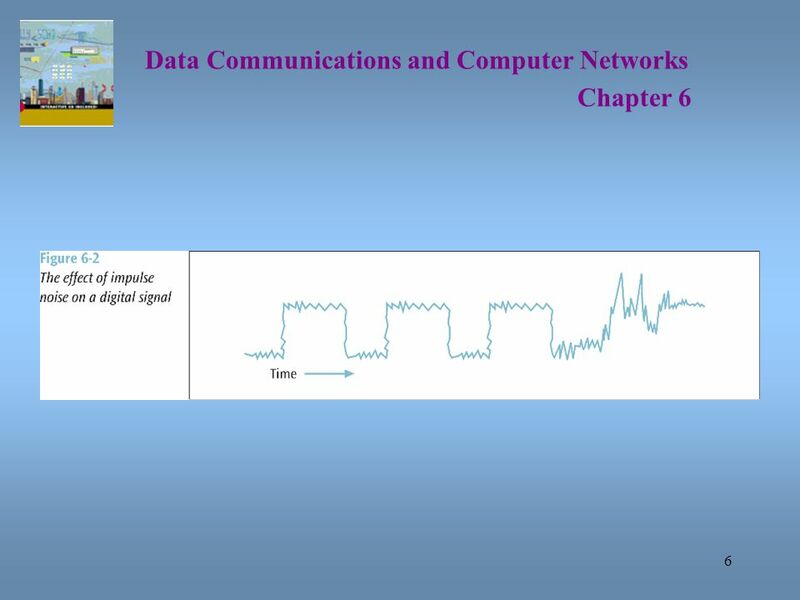 Chapter 6 Introduction Noise is always present. If a communications line experiences too much noise, the signal will be lost or corrupted. 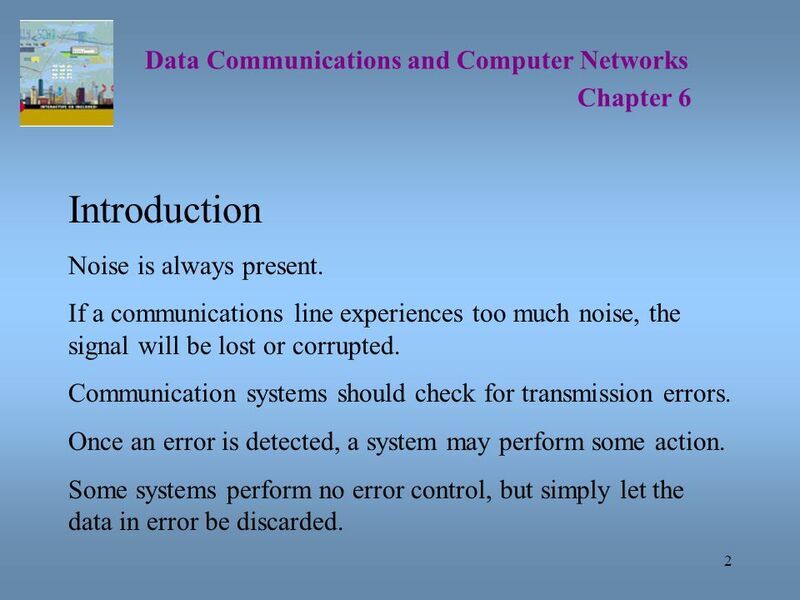 Communication systems should check for transmission errors. Once an error is detected, a system may perform some action. Some systems perform no error control, but simply let the data in error be discarded. 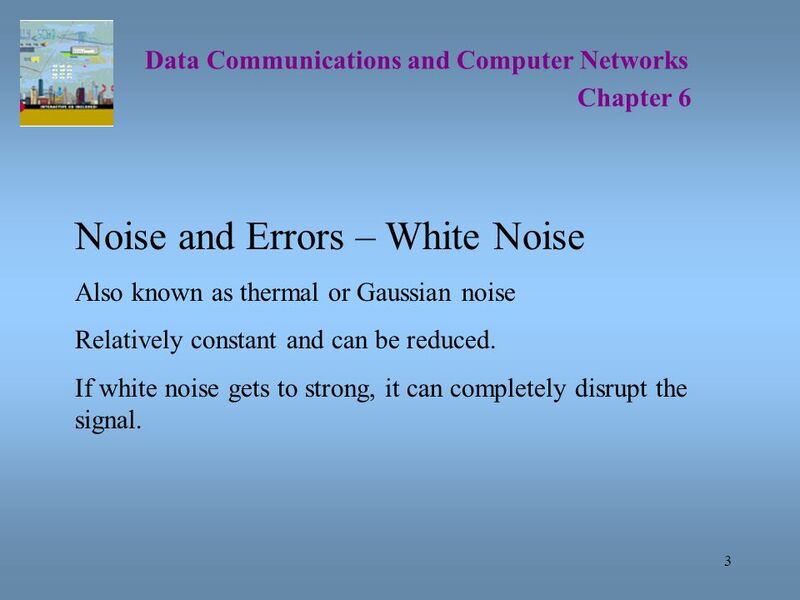 Data Communications and Computer Networks Chapter 6 Noise and Errors – White Noise Also known as thermal or Gaussian noise Relatively constant and can be reduced. If white noise gets to strong, it can completely disrupt the signal. 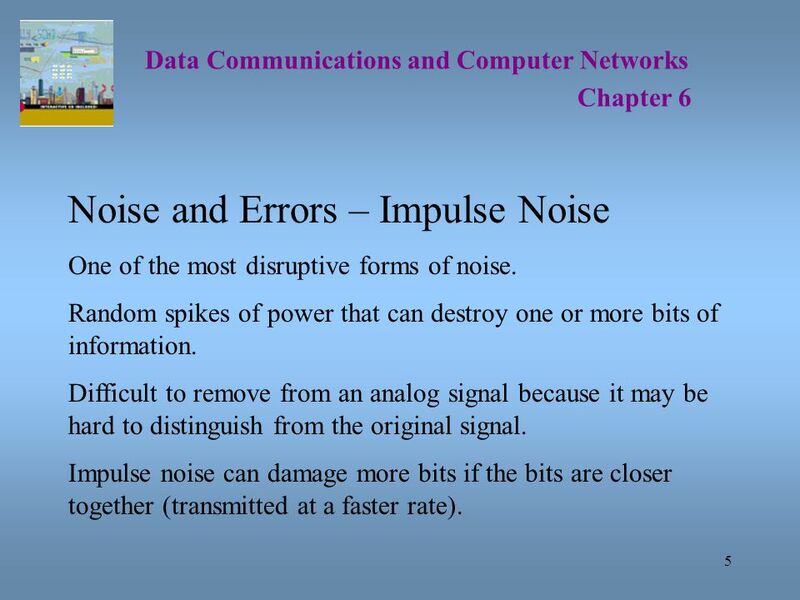 Data Communications and Computer Networks Chapter 6 Noise and Errors – Impulse Noise One of the most disruptive forms of noise. Random spikes of power that can destroy one or more bits of information. Difficult to remove from an analog signal because it may be hard to distinguish from the original signal. Impulse noise can damage more bits if the bits are closer together (transmitted at a faster rate). Chapter 6 The bottom figure should show much more distortion, completely blowing out one or two bits of information. 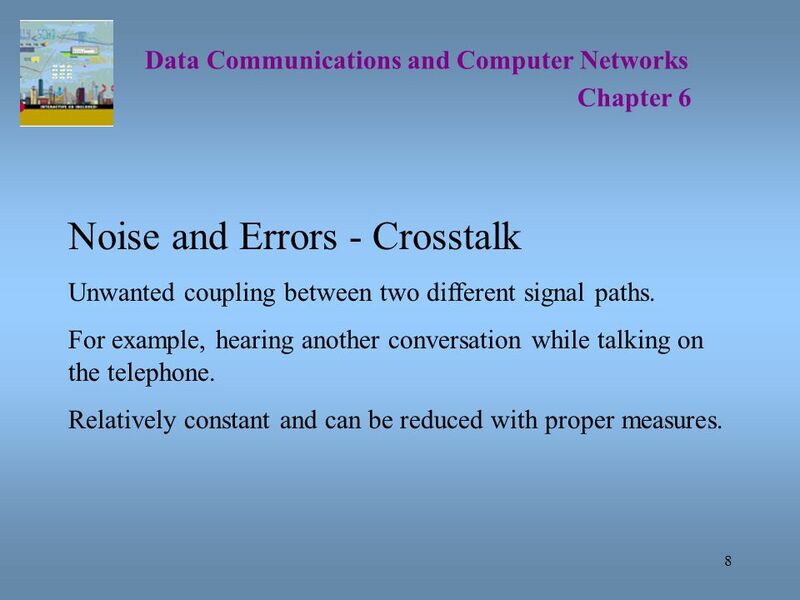 Data Communications and Computer Networks Chapter 6 Noise and Errors - Crosstalk Unwanted coupling between two different signal paths. For example, hearing another conversation while talking on the telephone. Relatively constant and can be reduced with proper measures. 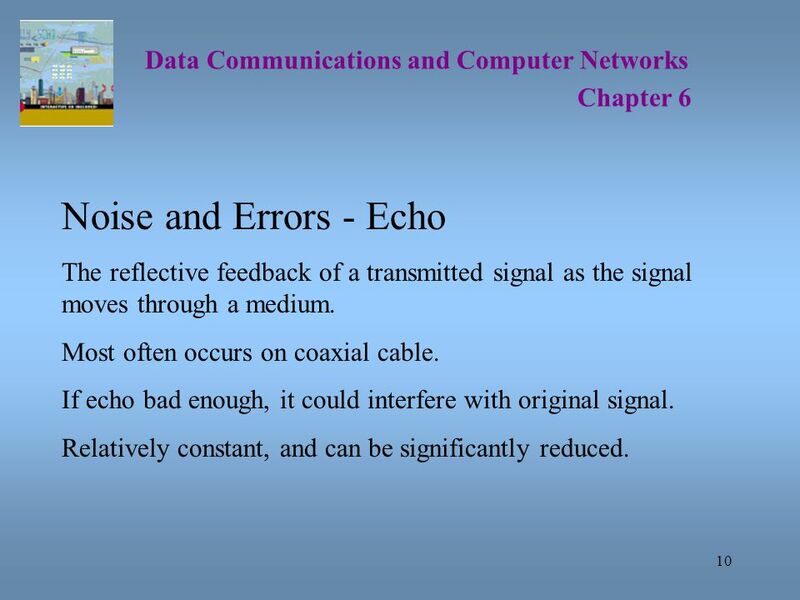 Chapter 6 Noise and Errors - Echo The reflective feedback of a transmitted signal as the signal moves through a medium. Most often occurs on coaxial cable. If echo bad enough, it could interfere with original signal. Relatively constant, and can be significantly reduced. 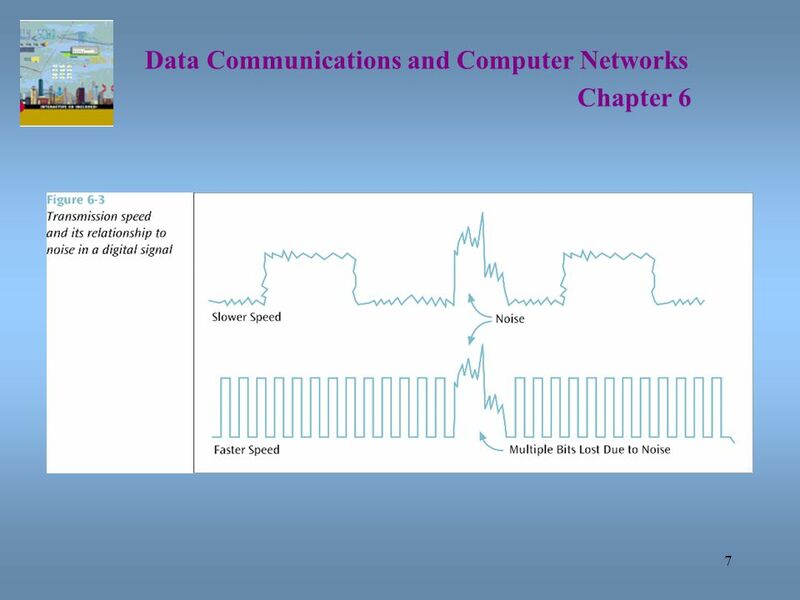 Data Communications and Computer Networks Chapter 6 Noise and Errors - Jitter The result of small timing irregularities during the transmission of digital signals. Occurs when a digital signal is repeater over and over. 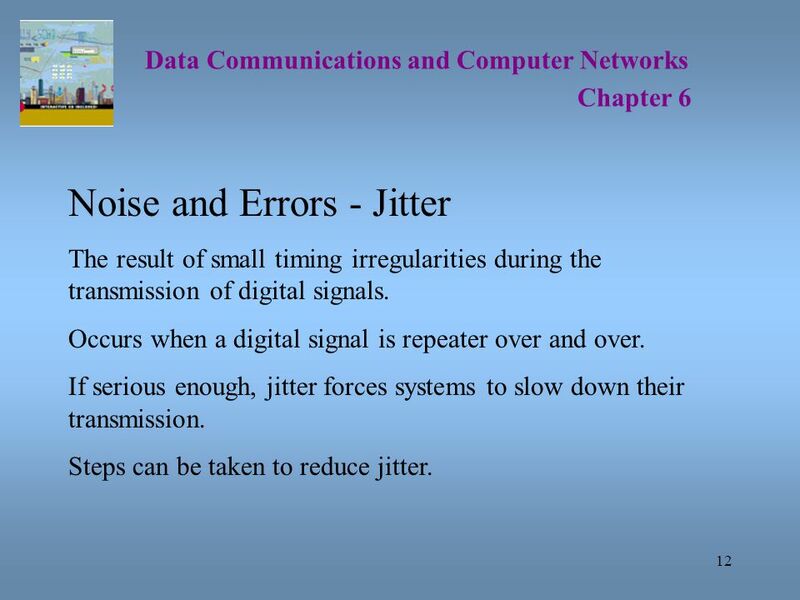 If serious enough, jitter forces systems to slow down their transmission. 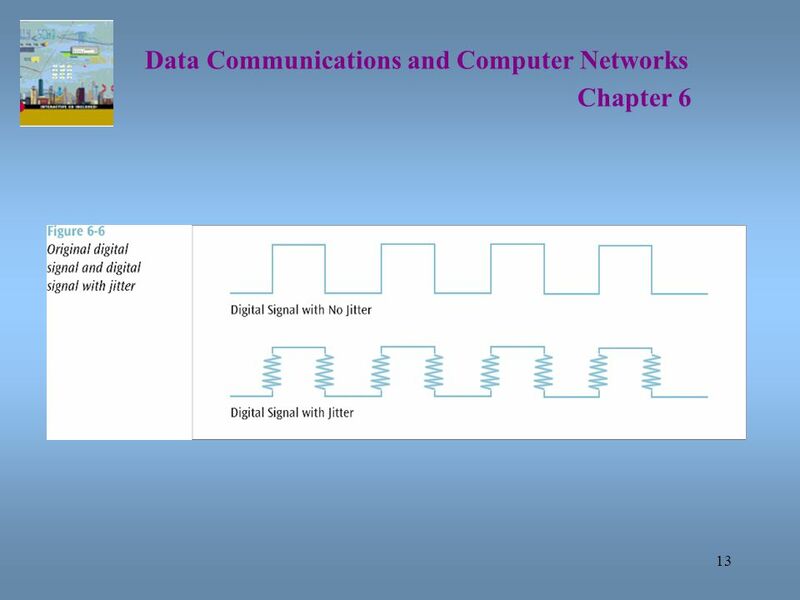 Steps can be taken to reduce jitter. 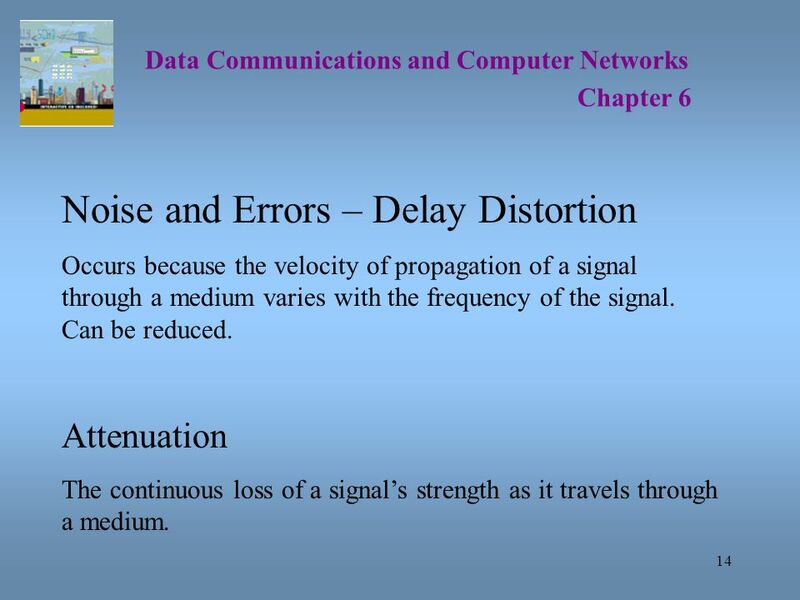 Data Communications and Computer Networks Chapter 6 Noise and Errors – Delay Distortion Occurs because the velocity of propagation of a signal through a medium varies with the frequency of the signal. Can be reduced. Attenuation The continuous loss of a signal’s strength as it travels through a medium. 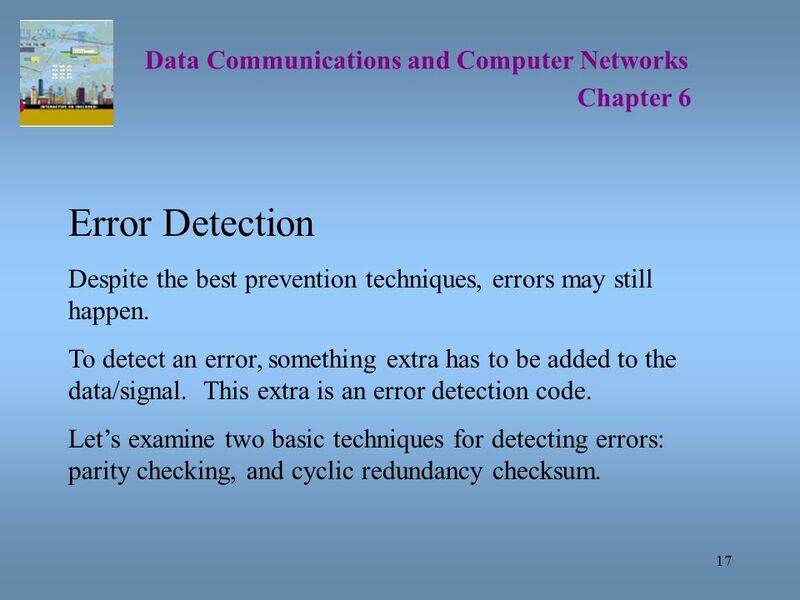 Chapter 6 Error Detection Despite the best prevention techniques, errors may still happen. To detect an error, something extra has to be added to the data/signal. This extra is an error detection code. 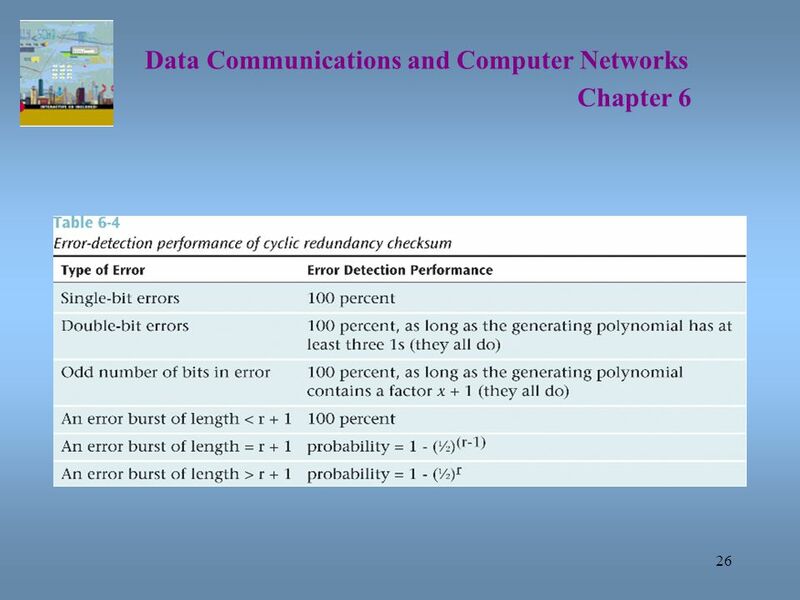 Let’s examine two basic techniques for detecting errors: parity checking, and cyclic redundancy checksum. 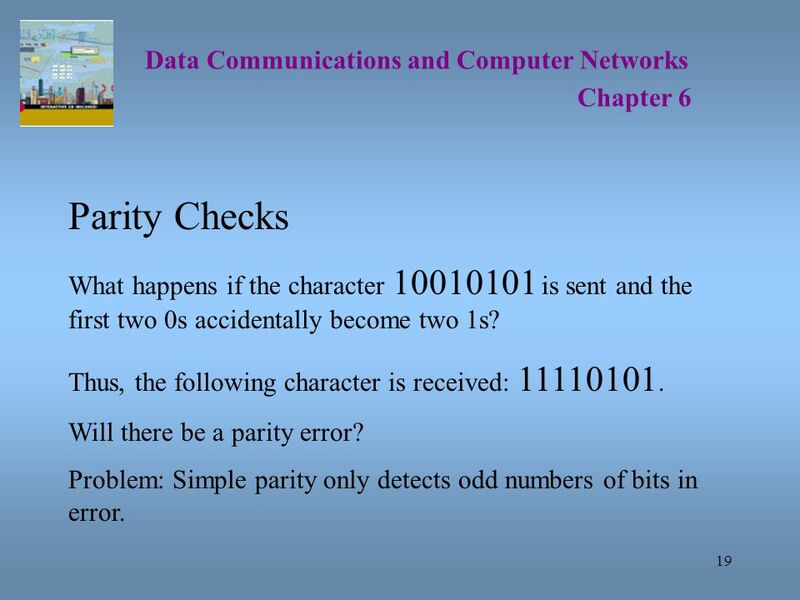 Chapter 6 Parity Checks What happens if the character is sent and the first two 0s accidentally become two 1s? Thus, the following character is received: Will there be a parity error? 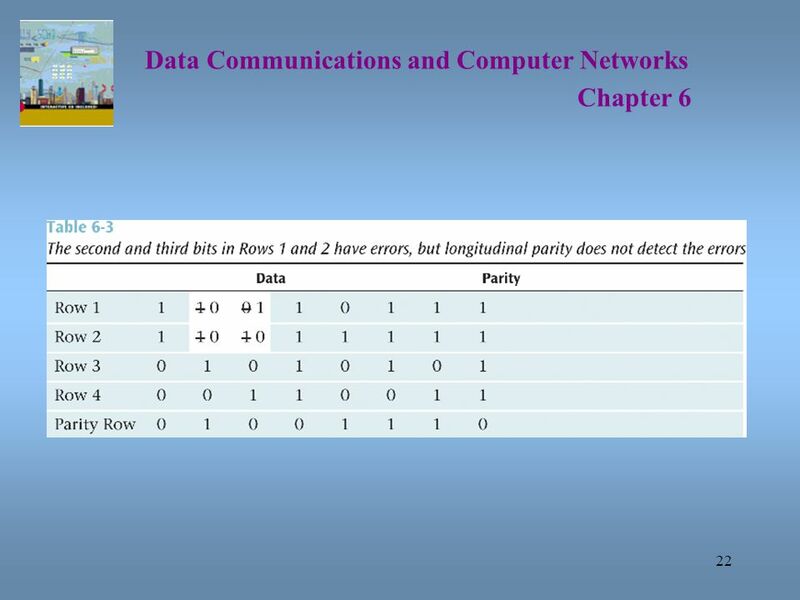 Problem: Simple parity only detects odd numbers of bits in error. 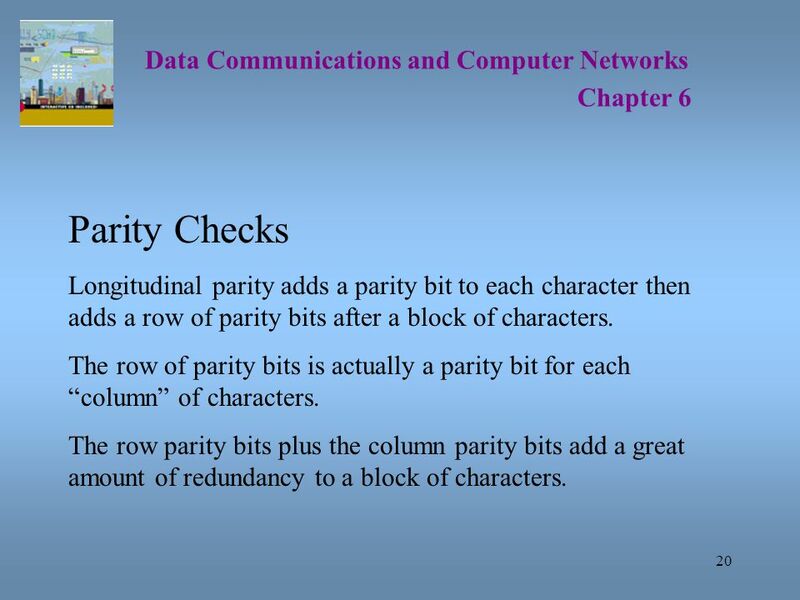 Chapter 6 Parity Checks Longitudinal parity adds a parity bit to each character then adds a row of parity bits after a block of characters. 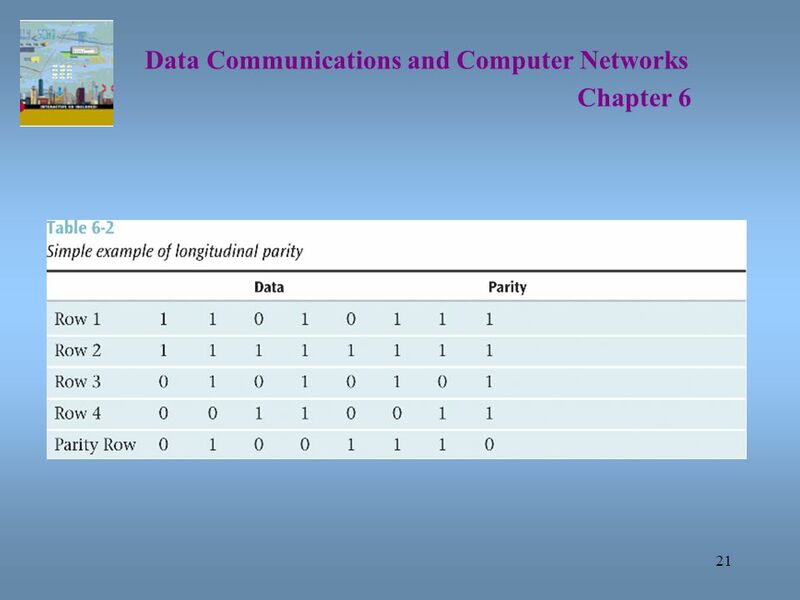 The row of parity bits is actually a parity bit for each “column” of characters. The row parity bits plus the column parity bits add a great amount of redundancy to a block of characters. 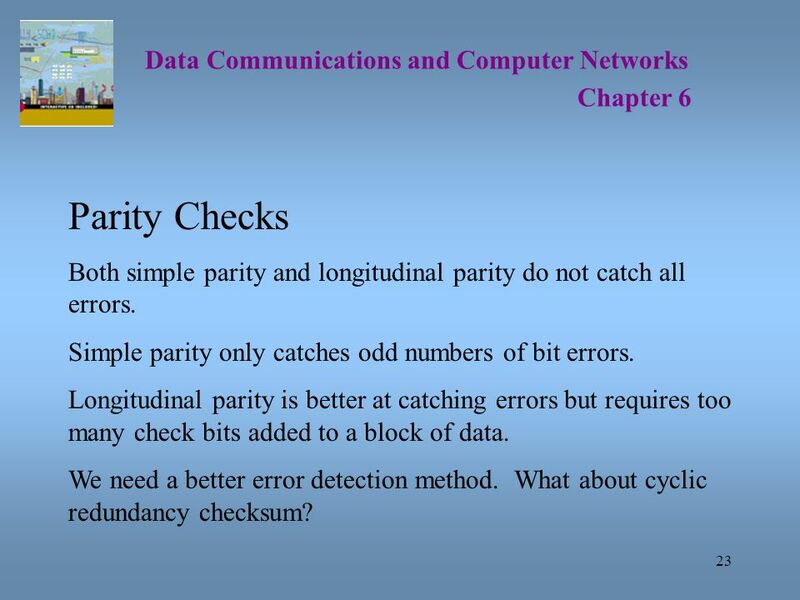 Chapter 6 Parity Checks Both simple parity and longitudinal parity do not catch all errors. 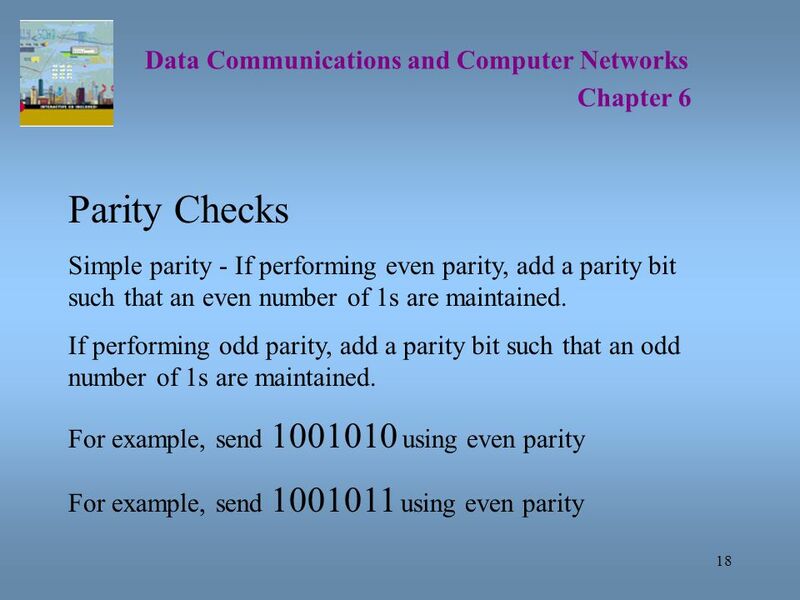 Simple parity only catches odd numbers of bit errors. Longitudinal parity is better at catching errors but requires too many check bits added to a block of data. We need a better error detection method. What about cyclic redundancy checksum? 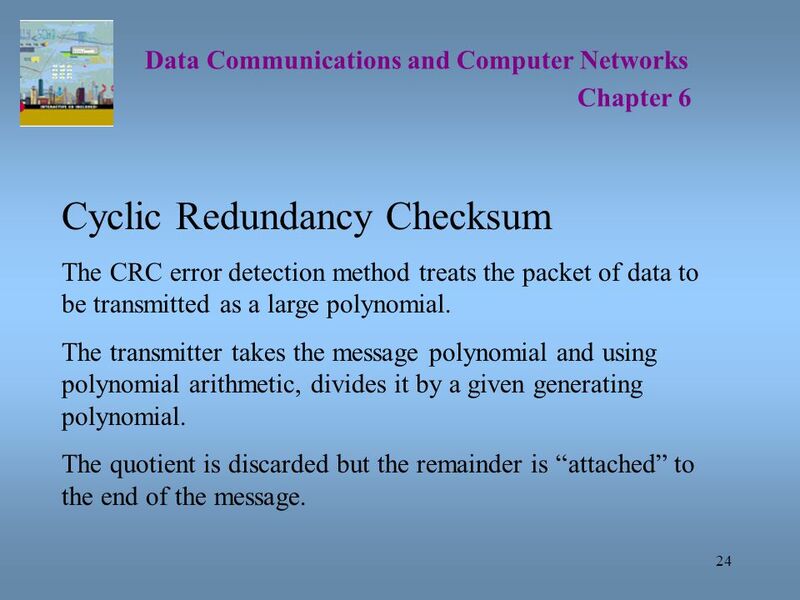 Data Communications and Computer Networks Chapter 6 Cyclic Redundancy Checksum The CRC error detection method treats the packet of data to be transmitted as a large polynomial. The transmitter takes the message polynomial and using polynomial arithmetic, divides it by a given generating polynomial. The quotient is discarded but the remainder is “attached” to the end of the message. 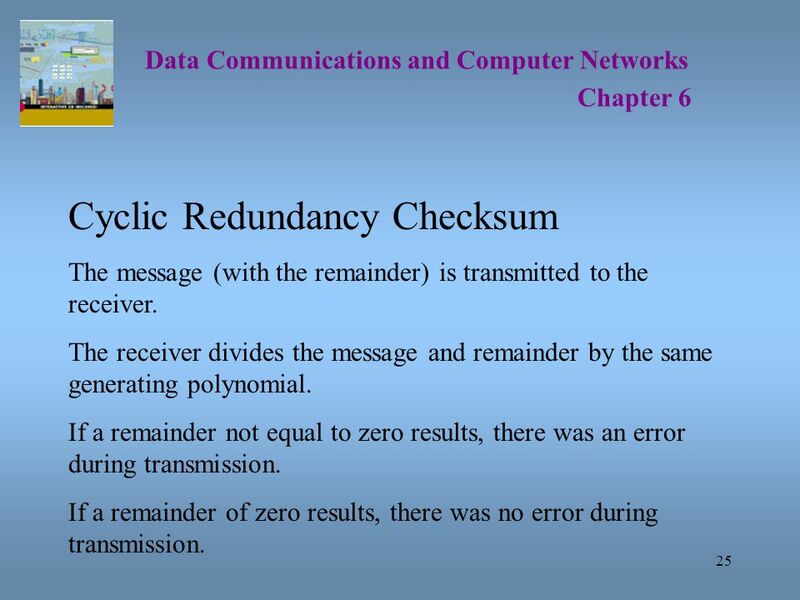 Data Communications and Computer Networks Chapter 6 Cyclic Redundancy Checksum The message (with the remainder) is transmitted to the receiver. The receiver divides the message and remainder by the same generating polynomial. If a remainder not equal to zero results, there was an error during transmission. If a remainder of zero results, there was no error during transmission. 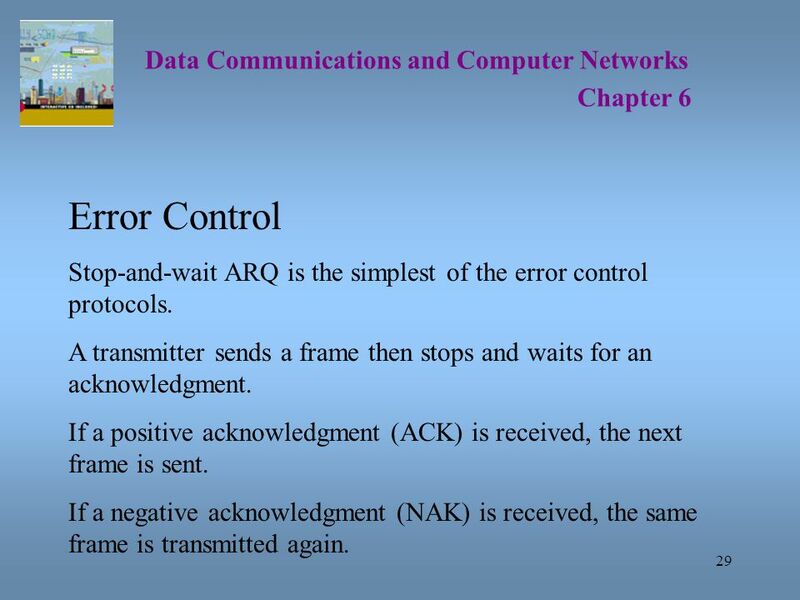 Chapter 6 Error Control Stop-and-wait ARQ is the simplest of the error control protocols. A transmitter sends a frame then stops and waits for an acknowledgment. If a positive acknowledgment (ACK) is received, the next frame is sent. If a negative acknowledgment (NAK) is received, the same frame is transmitted again. 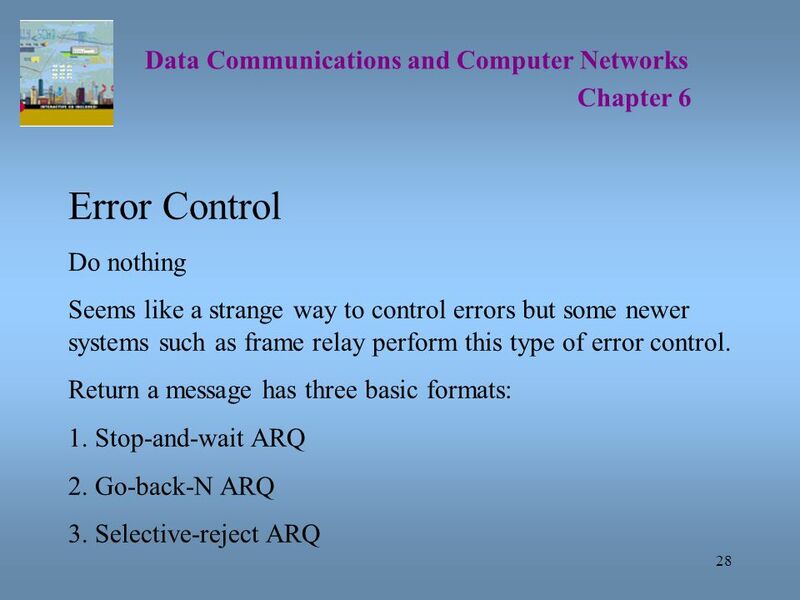 Chapter 6 Error Control Go-back-N ARQ and selective reject are more efficient protocols. They assume that multiple frames are in transmission at one time (sliding window). 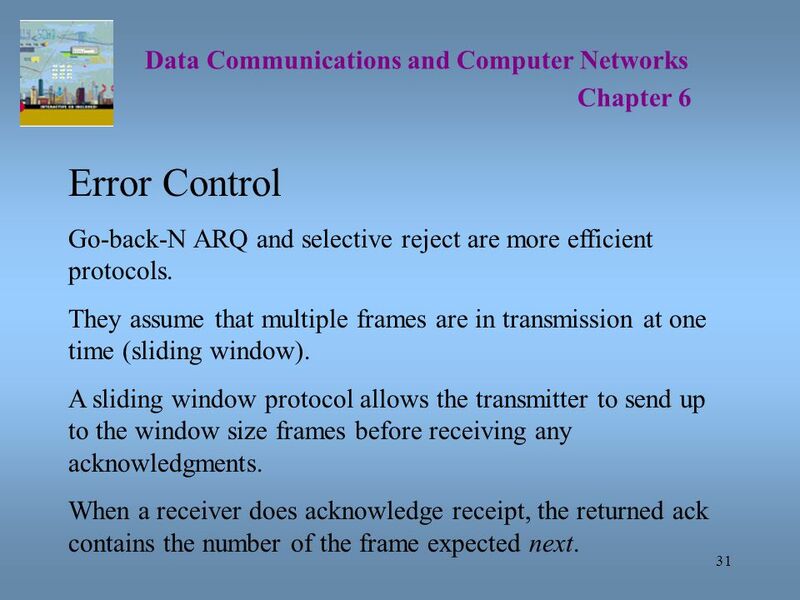 A sliding window protocol allows the transmitter to send up to the window size frames before receiving any acknowledgments. When a receiver does acknowledge receipt, the returned ack contains the number of the frame expected next. 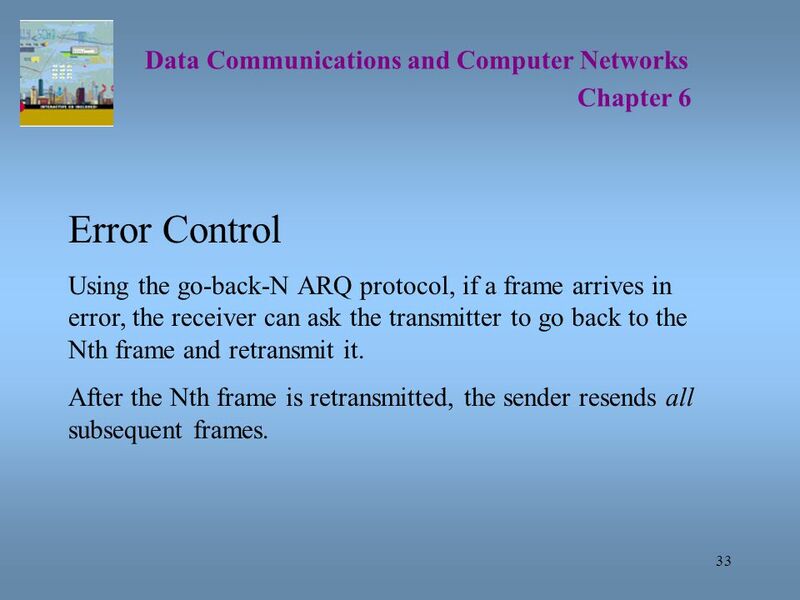 Chapter 6 Error Control Using the go-back-N ARQ protocol, if a frame arrives in error, the receiver can ask the transmitter to go back to the Nth frame and retransmit it. After the Nth frame is retransmitted, the sender resends all subsequent frames. 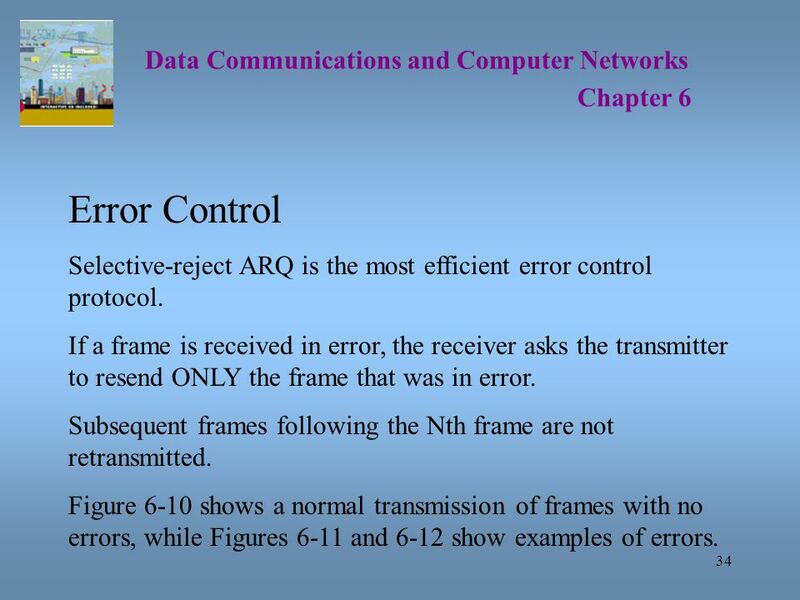 Chapter 6 Error Control Selective-reject ARQ is the most efficient error control protocol. If a frame is received in error, the receiver asks the transmitter to resend ONLY the frame that was in error. Subsequent frames following the Nth frame are not retransmitted. Figure 6-10 shows a normal transmission of frames with no errors, while Figures 6-11 and 6-12 show examples of errors. 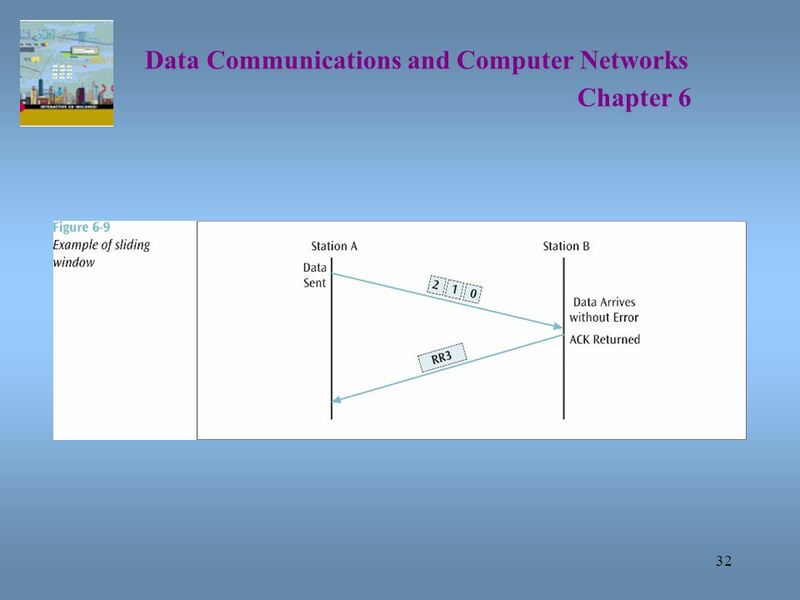 Chapter 6 Error Control For a receiver to correct the error with no further help from the transmitter requires a large amount of redundant information accompany the original data. This redundant information allows the receiver to determine the error and make corrections. 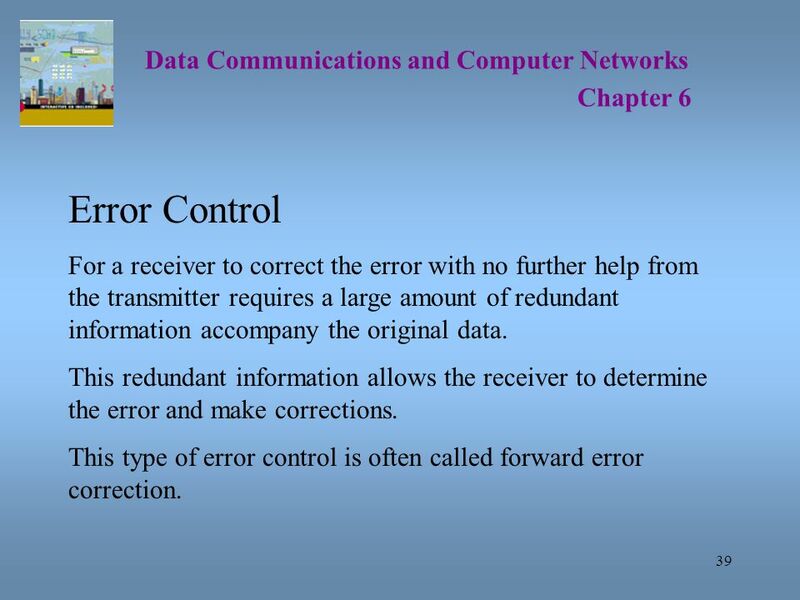 This type of error control is often called forward error correction. 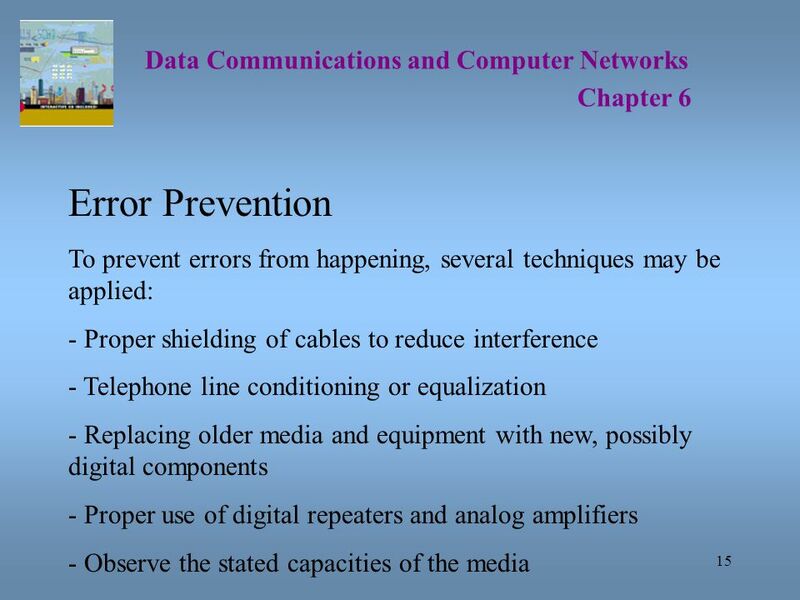 Data Communications and Computer Networks Chapter 6 Error Detection and Error Control in Action Asynchronous transfer mode (ATM) incorporates many types of error detection and error control. ATM inserts a CRC into the data frame (the cell), which checks only the header and not the data. This CRC is also powerful enough to perform simple error correction on the header. 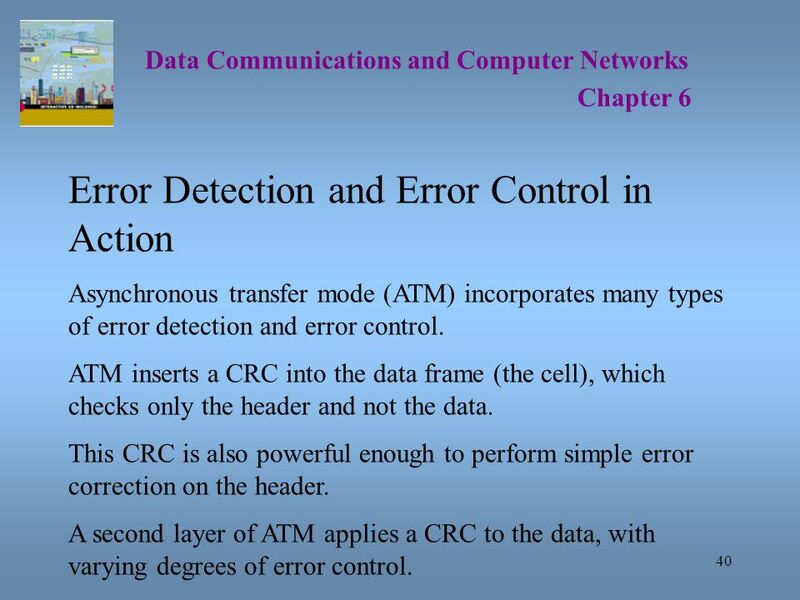 A second layer of ATM applies a CRC to the data, with varying degrees of error control. 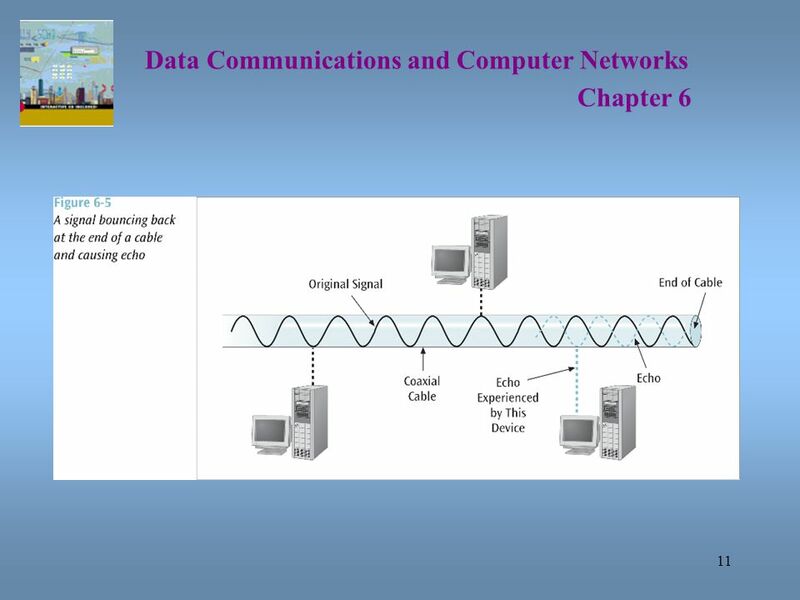 Download ppt "Chapter 6 Errors, Error Detection, and Error Control"
EE 4272Spring, 2003 Chapter 7 Data Link Control Objectives: Effective & reliable data communication between two directly connected transmitting-receiving. 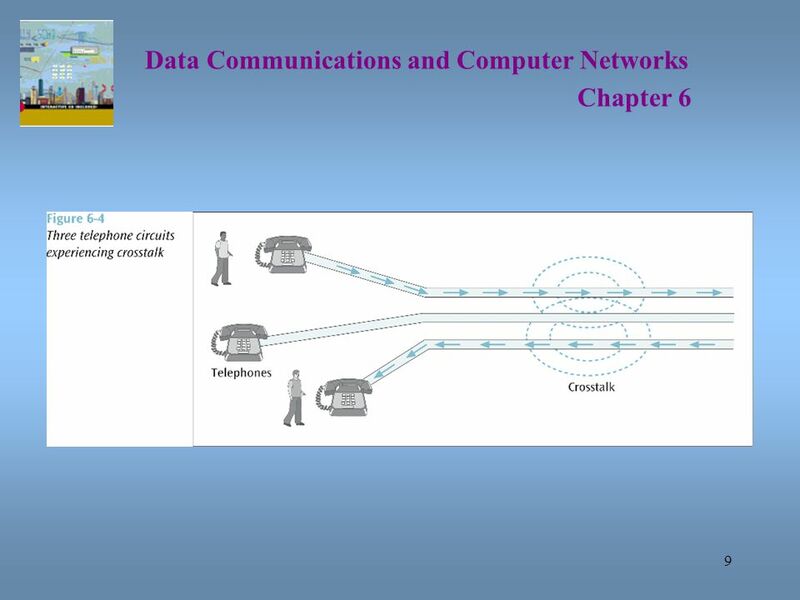 EIE325: Telecommunication TechnologiesMaciej J. Ogorza ł ek, PolyU, EIE Telecommunication Technologies Week 8 Flow Control Error Control. 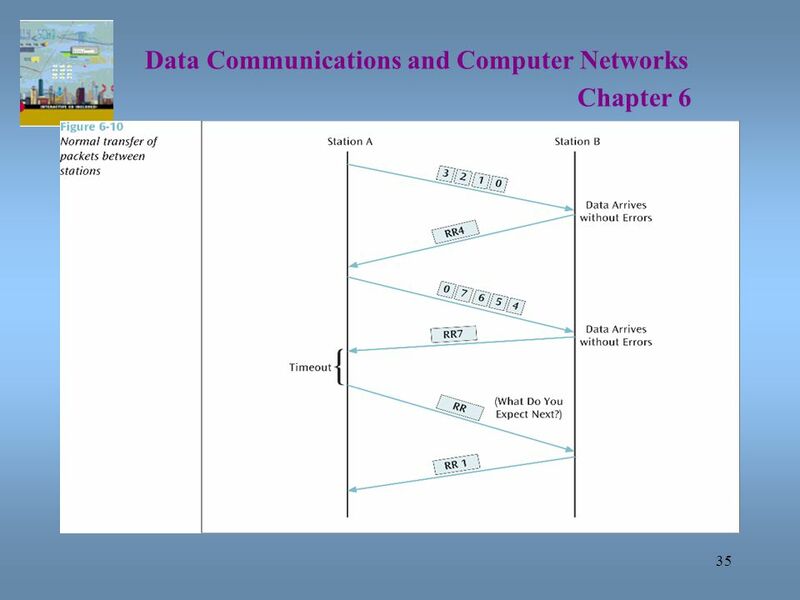 McGraw-Hill©The McGraw-Hill Companies, Inc., 2004 Chapter 11 Data Link Control and Protocols. 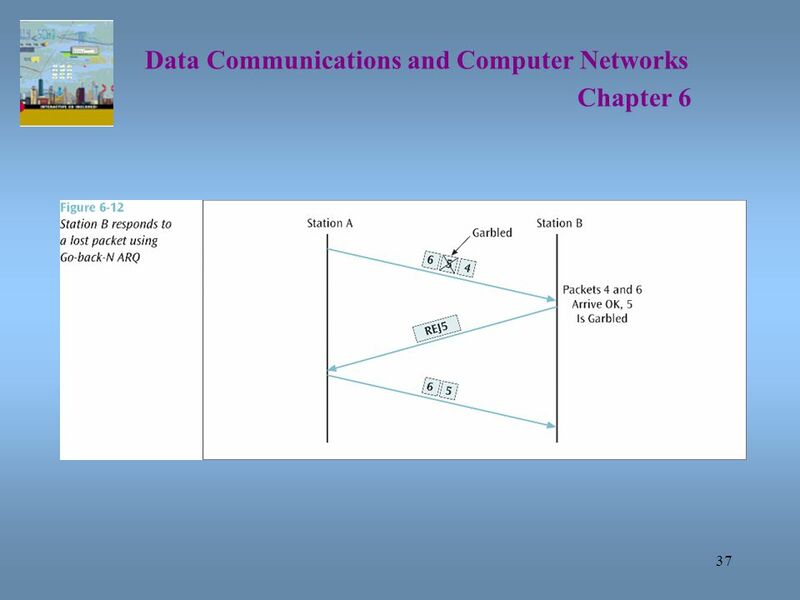 8-Reliability and Channel Coding Dr. John P. Abraham Professor UTPA. 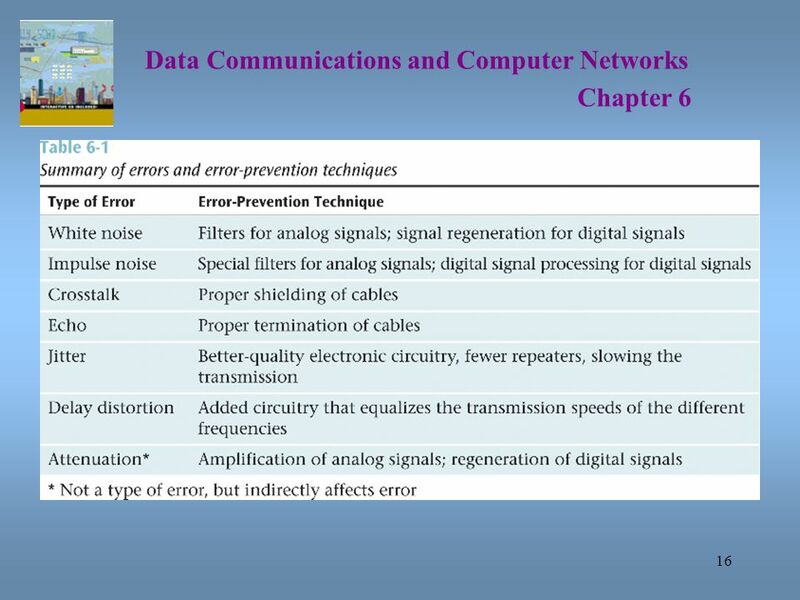 Chapter 6 Errors, Error Detection, and Error Control. 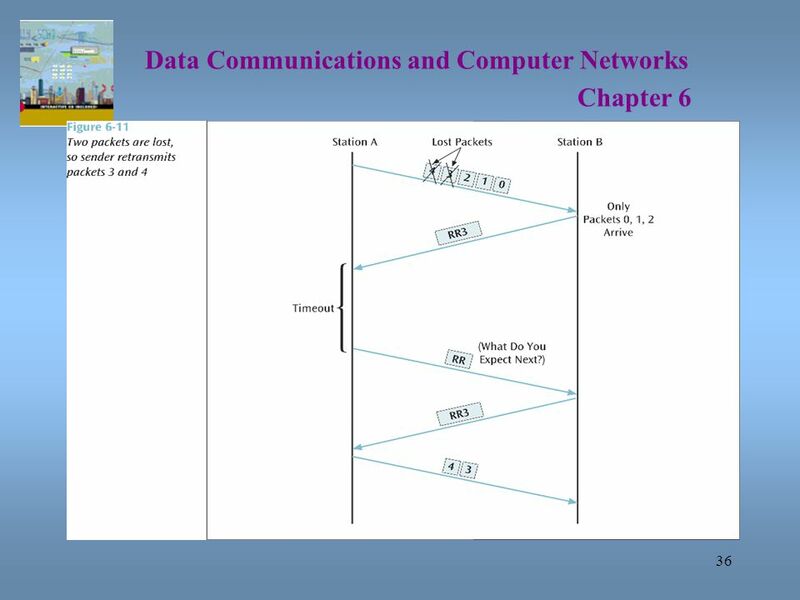 Data Link Layer – Part 1 V.T.Raja Oregon State University. 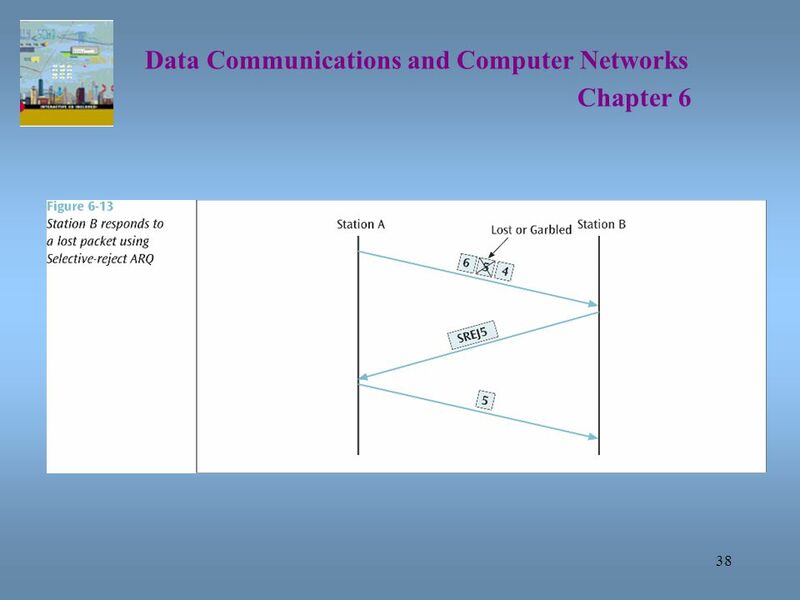 CSCI 4550/8556 Computer Networks Comer, Chapter 7: Packets, Frames, And Error Detection. 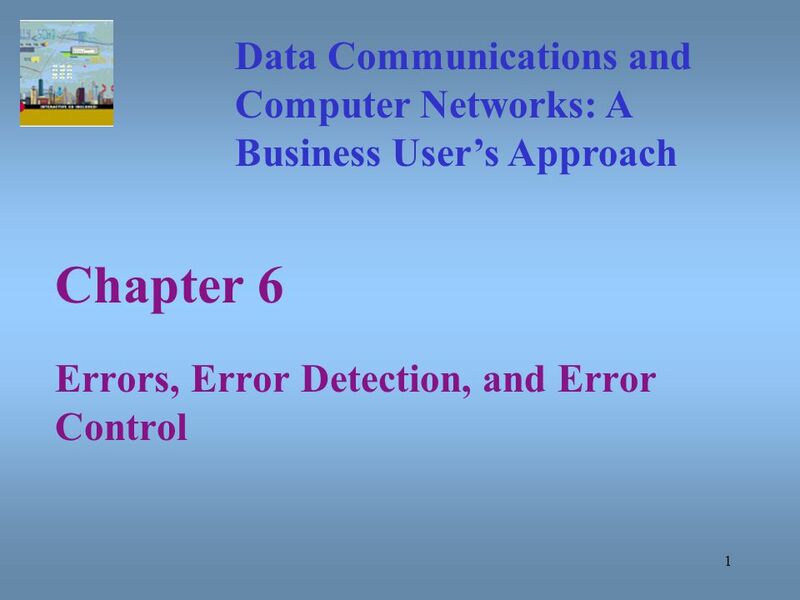 Chapter Six Errors, Error Detection, and Error Control Data Communications and Computer Networks: A Business User’s Approach Sixth Edition. 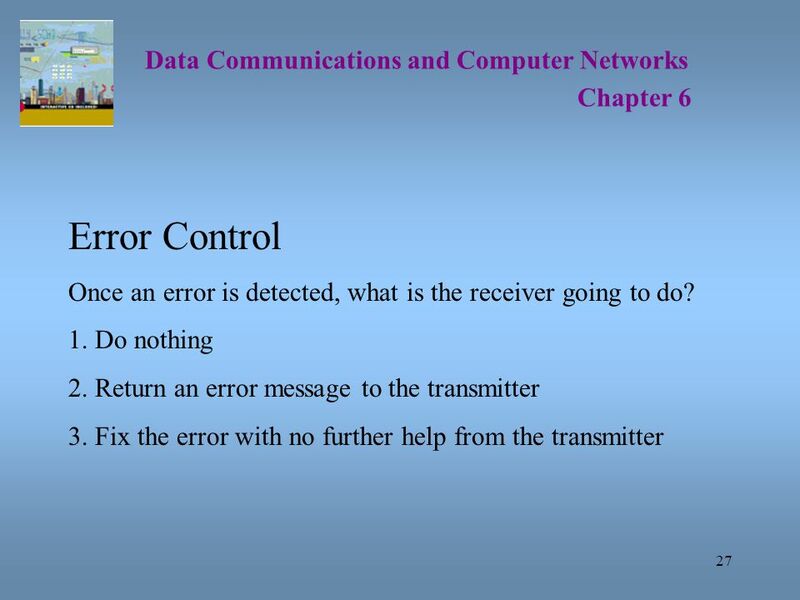 1 Chapter Six - Errors, Error Detection, and Error Control Chapter Six. 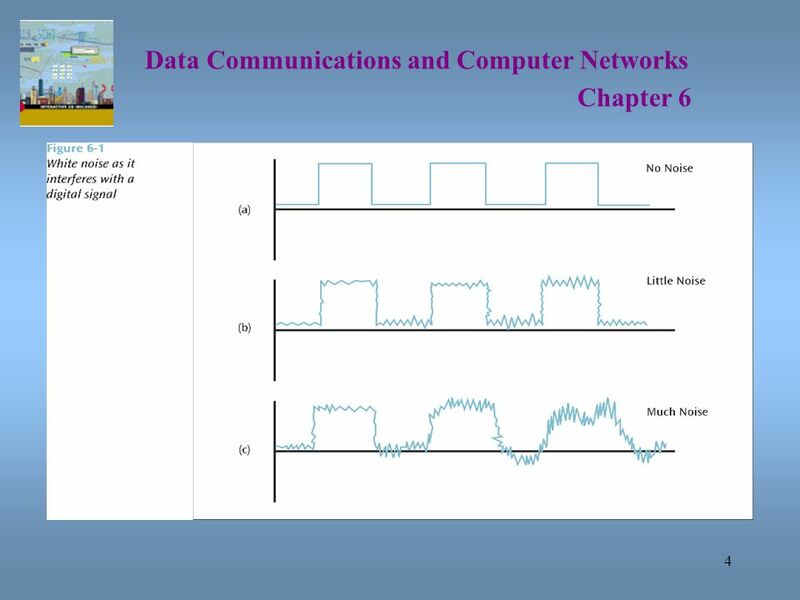 CMPE 150- Introduction to Computer Networks 1 CMPE 150 Fall 2005 Lecture 12 Introduction to Computer Networks. Long distance communication Multiplexing  Allow multiple signals to travel through one medium  Types Frequency division multiplexing Synchronous time. 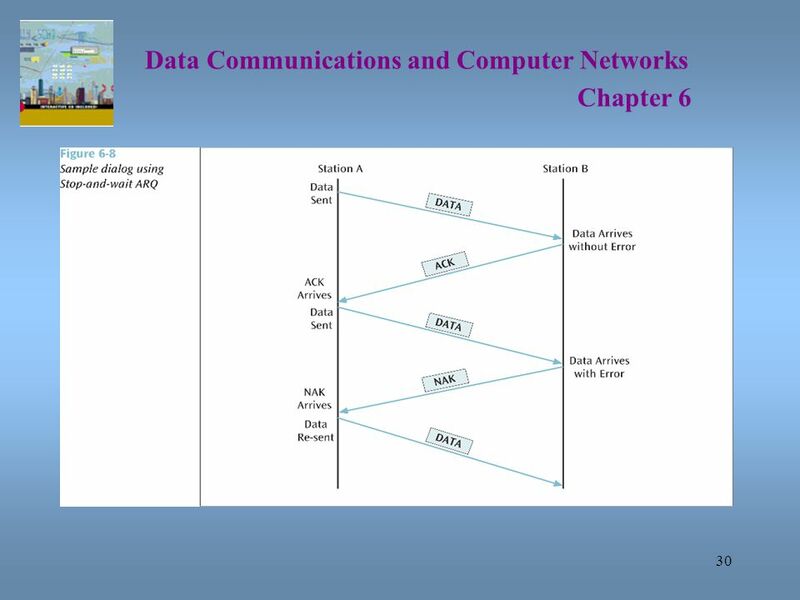 1 ITC242 – Introduction to Data Communications Week 10 Topic 16 Data link control. 1 K. Salah Module 4.0: Data Link Layer The Logical Link Control (LLC) sublayer –Framing –Flow Control –Error Control The Media Access Control (MAC) sublayer. Data Link Layer RAHUL DEVA.